In the middle of Del Mar village, minutes from the Del Mar Racetrack, steps from beautiful Del Mar Beach and an enticing array of boutiques, galleries, eateries and attractions, L’Auberge Del Mar, A Destination Hotel, is the place to stay during the Del Mar racing season. And, this year is the landmark 10-year anniversary of the Official Opening Day After-Party, held annually at L’Auberge Del Mar. The Opening Day After-Party and Winners’ Circle Racing Season packages promise racing thrills, posh accommodations, and travel memories. For summer travelers planning to arrive in August, there’s a Pacific Classic Party to attend at a special guest price. And to attend the races as stylishly as possible are pop-ups for fashion enthusiasts who want to look their best during the season. The Del Mar Thoroughbred Club is “as cool as ever,” and iconic L’Auberge Del Mar is as welcoming and luxurious as ever. This Opening Day After-Party Package includes plush accommodations for two and two admissions to the fabulous 10-Year Anniversary Official Opening Day After-Party complete with food and beverages and dancing to the music of Southern California DJs FishFonics and Gabe Vega on the pool deck. This is the Del Mar party of the season! Package starts at $779 plus tax. The Winners’ Circle Racing Season Package offers Del Mar horse racing fans an enhanced way to go to the races and stay at the close-by iconic SoCal resort. It includes plush accommodations for two in a Cabana or Coastal room, signature Del Mar Julep cocktail for two and complimentary transportation to and from the Del Mar Thoroughbred Club, plus $150 Spa L’Auberge credit and complimentary hotel parking. Package starts at $799 plus tax. Based on availability during racing season. Races take place Wednesdays through Sundays. For those guests who are at the resort pre- and opening day are two pop-up shop attractions. Hat designer to the stars and “milliner to the Triple Crown,” Christine A. Moore Millinery, will entice the ladies with fabulous headpieces to flaunt at the races and at the Opening Day After-Party. And, luxury bespoke menswear stylists and master tailors purveyor Élevée, will also be popping up. Retail times are Monday, July 16, and Tuesday, July 17, from 10 a.m. to 2 p.m. and 3 to 6 p.m.; opening day on Wednesday, July 18, will be from 9 a.m. to noon. It’s the 10th year for this over-the-top event of the year for Del Mar race fans. L’Auberge Del Mar celebrates with performances by Southern California DJ FishFonics and DJ Gabe Vega. Delicious bites from Chef Nathan Lingle will be available at food stations throughout the resort. Specialty cocktails like the race season signature Del Mar Julep will be concocted at the bars. Ticket pricing: up to July 17 at $229, plus tax, and day-of party tickets will be sold on July 18 at $260 until capacity, plus tax. Must be over 21 to purchase. L’Auberge Del Mar’s Pacific Classic Party Friday, August 17, from 6 to 11 p.m. 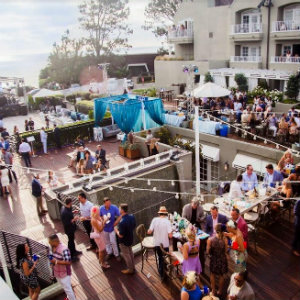 This chic party to benefit the Winners’ Foundation is an added attraction to those L’Auberge Del Mar guests planning to go to the races in August. From 6 to 8 p.m., party goers will be entertained by the David Shyde Trio while enjoying passed bites and food station gourmet fare, along with drinks from the cash bar. From 8 to 8:45 p.m., there will be a presentation and auction. And, from 9 to 11 p.m., it’s DJ time with a cash taco station and bar. L’Auberge Del Mar is at 1540 Camino Del Mar in Del Mar. 858.259.1515.